For years we have prayed to the mighty gaming gods with just one simple wish, that being publishers/Devs would stop coming out with below average games using a character we once adored, seemingly cashing in on the nostalgia we once had that for that series/character. If we're being honest with each other here, Sonic really hasn't seen a good game since the early years, with only Generations (in my eyes) being the best of a bad bunch of games that I can think of off the top of my head. I've said it before in other reviews of Sonic games, Sonic is probably the reason I sit here being the gamer I am today. Sure, I played the crap out of my Dad's Atari 2600 back in the day, but it was the day I met Sonic one Christmas morning getting a Mega Drive where I really started to fall in love with gaming. Sonic Mania has been met with a lot of love from both reviewers and gamers since its release on August 15th, with this review set to be no different. Sonic Mania is a game that simply gives fans what they have been crying out for on consoles for years. We've had games that while they tried bringing in new stuff to the franchise, they just weren't the games and reasons we loved the blue guy back in our younger days. While Sonic Mania gives all those guys who go on about 60FPS their wish, the thing what Mania does best is just giving us back the classic Sonic experience most of us grew up with. Letting us enjoy something once again, and allowing us to remember how easily pleased we all once were. Sonic Mania has the story mode along with the standard forgettable story that goes with it, but the game itself offers the classic Sonic experience that will let us old guys enjoy it, while also letting new guys get something out of it too. Simply push right and watch as this hedgehog tries to become a blur on your screen is how most levels play out, with some of those levels having bosses at the end of them that require a certain technique if you wish to hit them with the legendary spin jump. 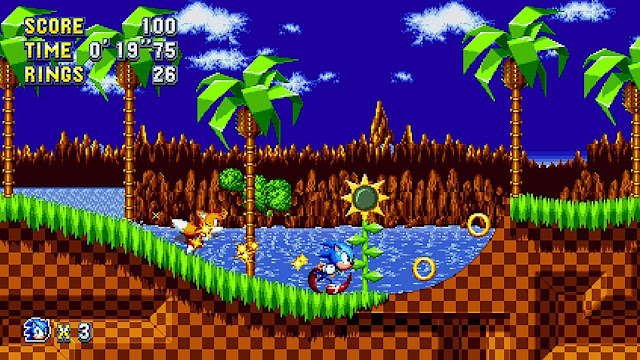 You can also try your best to collect the Chaos Emeralds from entering the giant golden rings found on levels, and also try your best to hunt down silver and gold emblems by collecting blue balls and coins in another small level which is found by having a 30 coins for the lollipop style checkpoint markers throughout each level. For the campaign you can play as Sonic & Tails, either of them alone, or Knuckles (why the hell you would want to do this with his annoying control system is beyond me). You also have Time Attack and split screen competition to dig into via the menus, but with that said, these modes weren't something I found myself using that often with the time put into the game, so for me were very much throw away modes. Overall: Sonic Mania does something that many fresh takes on games sadly do not do, that's cut the crap of trying to be something it isn't and just giving fans a classic experience which still stands strong in the current day. Keeping it simple is why many have fallen in love with Sonic Mania after many years of the series just trying to do too much to the game. I for one have enjoyed hearing sounds, music, and levels I once loved as a younger gamer, with the game also offering enough to make it feel like a brand new Sonic experience. Fans will love it, new guys will finally get a chance to experience why we fell in love with the series when we first played the original. It's a win for everyone, so go and buy it. Glad that it is a decent game. Been a while. Great review man. I will get it at some point. Seriously lacking funds at the moment.